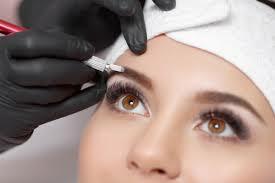 The technique of 3D Microblading has been popular in Asia for over 25 years and is a unique process tailored to benefit individuals who desire brow definition, to cover gaps of lost hair, to extend an area, or full reconstruction if the brows have little or no hair. Choosing an artist with expertise and impressive technique is critical for achieving naturally enhanced brows; Because each stroke is made individually, the artist can perfect the clients specific shape, colour, and density. You are in safe hands with Anita, a very experienced therapist and beauty teacher who not only understands the treatments but has the knowledge of all relevant anatomy and physiology ensuring your treatment is right - and safe for you. The treatment (semi permanent) can last between 12 – 36 months following correct aftercare. It is a 2-step treatment with 2 applications to achieve the final result, the second application usually carried out 6 weeks after the first. Immediately post treatment, eyebrows will appear darker than expected, but will fade 50% during the healing process over the following 2 weeks. The 2nd application 6 weeks later includes a touch up to ensures micro pigments are healing properly and responding well. ​Note* Prices for infilling/top-up will be reduced on consideration of how much there is to "top-up". This can be discussed at consultation. Please read "pre-existing conditions" below. The microblading treatment can take 2.5 hours to complete. Are there any pre-existing conditions that should be considered before a Microblading treatment? • Do not take Aspirin, Vitamin E or Ibuprofen 24 hours before treatment. • Any laser or chemical treatments or peelings, and/or any creams containing Retina-A or Glycol Acid on the face or neck. • Before showering apply a layer of post-care cream to protect your eyebrows from moisture. During the shower keep your face away from the shower head. Itching and flaking may appear during the first seven days, however, experience has shown that by following these aftercare instructions these symptoms may quickly disappear. • Once completely healed, always apply a layer of sunscreen SPF 30 on your eyebrows when exposed to the sun. Sun exposure might cause the colour pigment to fade away more quickly.